The award-winning DENVER WOMAN magazine launched in February 2006 with anchor Anne Trujillo gracing its premier issue. Since then, DENVER WOMAN has featured Lieutenant Governor, Jane Norton and Janet Elway among many Denver area women inside the publication for their various talents and expertise. 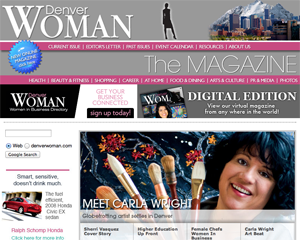 The publications are featured on the website DenverWoman.com that not only profiles women in the Denver area, but also features articles about beauty and fitness, family issues, health matters, dollars and sense, travel, dining, art and culture, fashion, and Colorado homes.